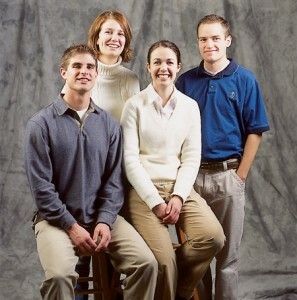 More than 100 BYU undergraduates received Alumni Association Replenishment Grants and Chapter Replenishment Grants in 2003 to help them finance their educations. At least that many students will also be assisted this year, and those interested must apply online before April 15. Every year replenishment grants help scores of students like (from left) France J. Nielson, ’05, Jillian J. Foster, ’05, Emily Martineau, ’04, and Glen R. Sanders, ’05. In turn, recipients are later able to help others by voluntarily replenishing the grants. Photo by Bradley Slade. The grants—offered by the Alumni Association and 33 alumni chapters across the country—are given to students whose educational expenses are not met through other financial-aid programs. Inspired by the Church’s Perpetual Emigration Fund, the grants were created more than a decade ago. In the 1850s many European converts to the Church of Jesus Christ lacked the financial means to gather to Utah. The Perpetual Emigration Fund enabled tens of thousands of members to do so. In turn, they were asked to repay the funds so others could follow. Students selected to receive replenishment grants follow the same principle: they not only receive financial aid for themselves, but they also assist those who follow. Just as the Perpetual Emigration Fund met a need and blessed lives, the replenishment grants help students reach their goals, for which assistance they express gratitude. The chapter grants are funded by donations from alumni and friends of the university in particular areas of the country. In each case, an endowment to support the grants has been established, often after years of effort by dedicated individuals. In like manner the Alumni Association has built a general endowment with funding from various sources. Info: Grants are available through the Alumni Association and from chapters that offer the aid to students from their geographical areas. Grants are awarded in half- or full-tuition amounts. Applicants must have a minimum 3.0 GPA and demonstrate financial need. Need will be established from the Free Application for Federal Student Aid (fafsa.ed.gov) and information provided on the application. Recipients are eligible to reapply each year. 1. Go to the BYU Scholarship Office Web page: ar.byu.edu/dept_scholarships/scholar.html. 3. Select “Fall/Winter Scholarship Application,” and choose the comprehensive application. Provide the information requested on the following pages. 4. One of the last pages in the application lists scholarship opportunities. Choose “Alumni Replenishment Grants,” then select the chapter in which you live and answer the questions. If your chapter is not listed, select “University” and provide the required information. 5. The program will return you to the list of scholarship opportunities. You may add another scholarship or proceed to the final page, where you complete the process by clicking on the submit button.